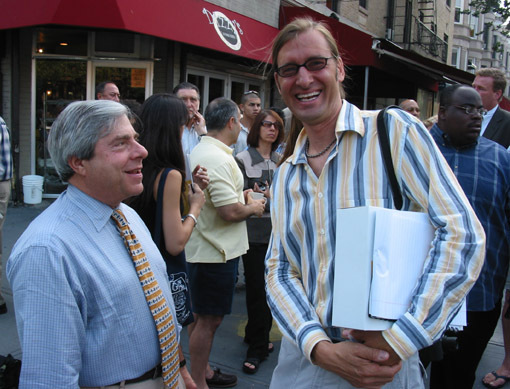 Brooklyn Borough President Marty Markowitz and 9th St. resident Konrad Kaletsch at Dizzy’s Diner, Eighth Ave. and 9th St., August 2, 2005. That’s DOT Borough Commissioner Lori Ardito in the background wearing shades and looking none too happy to be harangued by Park Slopers demanding safer streets. I led my neighborhood in a successful endeavor to make 9th street a safer thoroughfare for both pedestrians and vehicles in August 2005. Your support at that time made a huge difference (the result that had the greatest impact was the new traffic light installed at 10th street that slows traffic entering the 9th st intersection). There is a new initiative to make changes to the street that further fulfills on making 9th street safe. I am referring to the DOT plans to reduce the two lanes to one and adding bike lanes and a meridian in the middle. Having looked at the proposal, I see that it is a safety win/win for pedestrians and vehicles and not only support the plan myself, but believe that the 1200 people that signed the 2005 petition would support this step toward safety and traffic calming as well. I request your support once again in urging DOT to move forward with this improvement. Thanks. What needs to happen is you need to show how George Bush hates bike lanes, If you can do that then all the Democratics of the slope will switch instantly. Without that they can barely give a crap about anything. Ninth Street is almost over, Mark, I promise. You, my friend, know your Slope. Who Opposes A Plan for Safer, More Livable Streets and Why?